One M2M Technology Platform. Multi-Network Device Management. ORBCOMMconnect is a new kind of M2M service delivery platform designed to reduce the complexity of managing multiple communication networks and management platforms. Enjoy one-stop, multi-network subscriber management, up to four levels of account structure, smart alerts and automation, a mobile app, and much more. Looking for M2M connectivity? Take advantage of one of our FREE special offers today! Activate more than 100 SIMs and get your first month of service FREE. Upgrade a device to 3G or 4G and get a FREE SIM. Send us a competitor SIM and get a FREE SIM from ORBCOMM. Reduce service complexity and integration via one unified web portal and API for managing and provisioning subscribers across multiple carriers. Both small and large enterprises can easily manage subscribers with up to four levels of account structure better visibility, analytics and control. Go beyond simple notifications by assigning account-wide alerts that trigger condition-based actions to control usage overages, subscriber status changes and more. Clean, easy-to-navigate user interface gives one-click access to key analytics, customizable tables, and pre-defined or custom reports that load quickly. White label the portal for your brand. 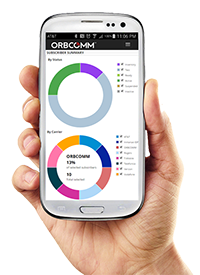 The ORBCOMM Mobile App, available for iOS or Android, enables you to view and manage subscriber status from the palm of your hand. PAYING TOO MUCH FOR IoT DATA?